If you visited Mount Auburn Cemetery this summer, and were not in a hurry to climb the Washington Tower or sneak a peek at an owl’s nest, you may have lingered by the entrance way and noticed a somewhat out of place brown filing cabinet. If your curiosity was aroused and you peeked inside, you would have found not papers and folders but instead mini-coolers full of tiny plastic bags, each one containing a sheet of paper, a pencil, and two plastics tubes: one full of Pecan Sandie crumbs and one full of Spam. And you may have thought to yourself, what the heck is all this about? It was, in fact, all about ants. As a community ecologist at Lesley University, I am passionate about all things insect, including sharing with others the vital roles that insects play in ecosystems and in our lives. While the importance of some insect groups to human activities is obvious, such as the pollinators without whom our agricultural systems would near collapse, other insects are often underappreciated. Such as ants. Ants are one of the most abundant insect groups on the planet – some have estimated there may be one quadrillion (that’s 1,000,000,000,000,000) ants on the planet at any given time. They are found in almost every terrestrial habitat on earth, forming the base of many food chains. Ants turn over soil, facilitate the growth of other insect and plant species, and breakdown garbage (it has been estimated that ants and other insects clean up several tons of food trash from city streets each year [Youngsteadt et al 2014])! Recent studies have warned that insects populations could be in a massive decline worldwide [Hallmann et al 2017], so finding ways to conserve ants and other insect populations within our urban landscape is particularly critical. So where do those little tubes of spam and pecan sandies fit into all this? This past summer I launched a Citizen Science ant survey program at Mount Auburn Cemetery, to get a better idea of how ant populations are using the cemetery and what kind of microhabitats within the cemetery best promote ant diversity and abundance. 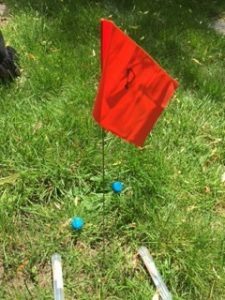 From June to mid-October, ant survey kits were available near the entrance for citizen scientists to leave out around the cemetery as bait to sample the ants present. I stopped by to pick up the used tubes and ID the species found. Twenty-six (26) people participated in the ant study, including elementary school children and adults of all ages. I am still in the process of identifying all the 100’s of ant samples collected (a slow and meticulous process!) but some interesting finds are worth noting. Many of the ants identified so far have been common urban species, such as the Pavement ant (Tetramorium caespitum) and the common Carpenter ant (Camponotus pennsylvanicus). However some species are more characteristic of natural habitats, especially those found near the woody Consecration Dell area. Many ant species need rock, twigs, leaf litter and other plant material to nest and overwinter in, so it is not surprising that an area with more of this natural material might harbor more species. One way to protect ants and other ground-dwelling insects in urban areas may be more “messy” landscaping – setting aside areas of parks, yards and other green spaces where leaves and branches can be left as they fall to create litter cover. I am excited to continue working with the ant samples and discover more patterns that could better inform how to manage urban areas for diverse insect conservation (not just the pollinators, though I certainly love them too!). I will be continuing and hopefully expanding Citizen Scientist opportunities to collect data on insects at Mount Auburn next season, so keep your eyes open for signs (and even file cabinets full of tubes of spam) when you visit Mount Auburn next year. Amy Mertl is an Assistant Professor, Biology, Lesley College of Liberal Arts and Sciences. 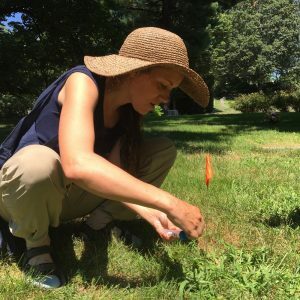 Read more about Citizen Science and Mount Auburn’s partnership with Lesley University researchers in the current issue of Sweet Auburn Magazine.